Hello there, today I am back to share another Christmas card with you. 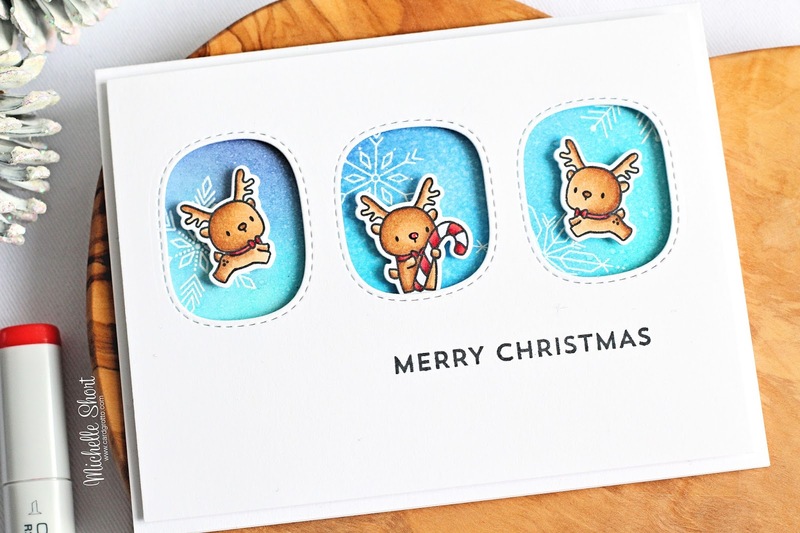 This one uses the adorable Little Reindeer Agenda stamps from Mama Elephant. I thought they fitted perfectly in the MFT stitched windows. I started off by stamping ME Holly's Snowflakes on to a piece of watercolour paper using Versamark Ink. I then applied white embossing powder and heat set. I blended over Distress Inks in Broken China, Salty Ocean, Peacock Feathers and Chipped Sapphire. The misted the piece with a solution of Perfect Pearls and water and set aside to dry. 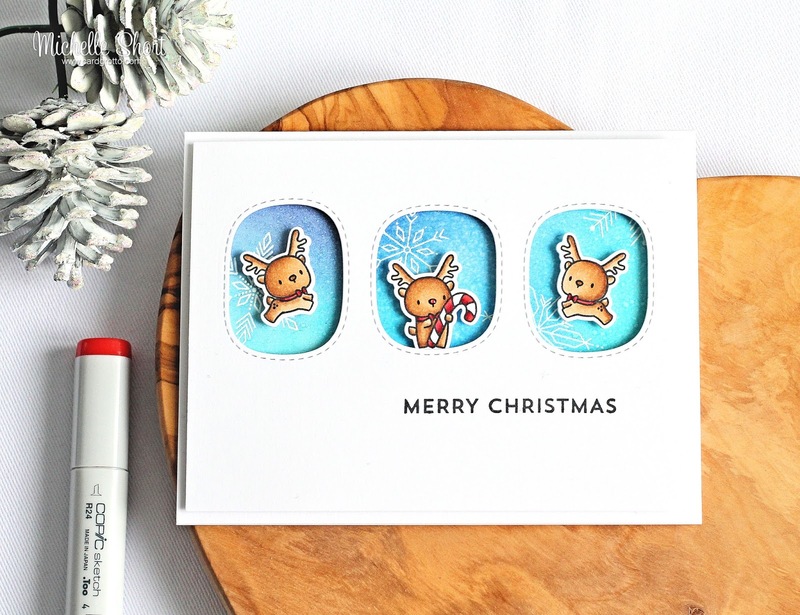 I took three of the reindeers from the Little Reindeer Agenda set and stamped these on to white cardstock with black ink. I coloured them using Copic Markers and then die cut them with the coordinating dies. I took a panel of white cardstock and cut the MFT Stitched Triple Peek A Boo Window die in to the top centre. I then took the 'Merry Christmas' sentiment from the MFT Snow Globe Sentiments set and stamped this on the panel under the windows. The background piece was added to a white A2 card base and then the window piece was added on top using foam tape. The reindeers were also added using foam tape. To finish off, I added a little Glossy Accents to Rudolph's nose. 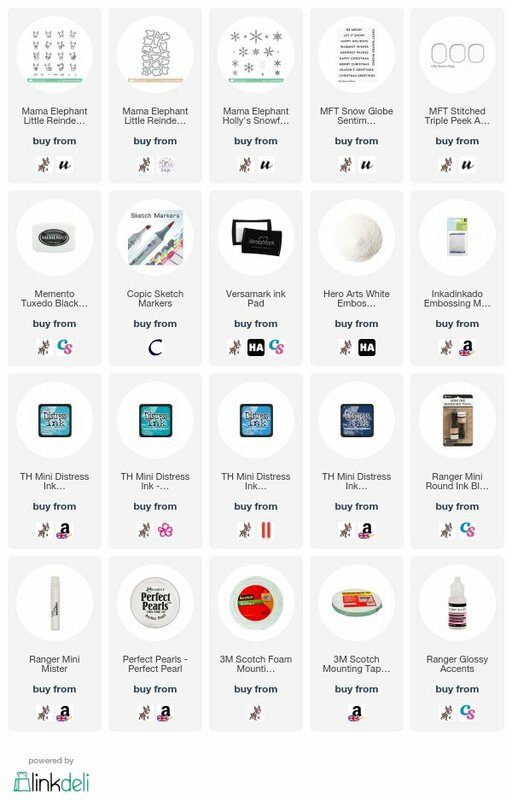 COPIC MARKERS - E57, E55, E53, R89, R37, R24, C2. Greetings from Canada, Michelle! I'm so happy to hear you are feeling better. I enjoy your blog and videos very much. You make absolutely beautiful cards. I want to wish you a very Merry Christmas and a happy, and healthy 2018! Cheers! Too darn cute! Love your sweet trio of reindeer. Merry Christmas!